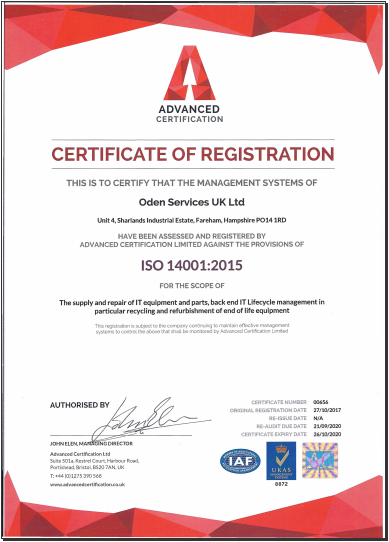 Processing is where Oden stand out and set the bar for the ITAD industry (IT Asset Disposal). Quarantine and Data erasure cages are the first stages of our internal process. Once data devices have been certified as sanitised or physically destroyed they are moved through to our workshops. Our market leading refurbishment process prolongs the life of 87% of the items collected. Once upgraded machines are put through our 21 point stress test, this highlights any potential component issues. On completion of successful testing, assets are boxed ready for an extended life. Assets that possess no intrinsic value or those beyond economic repair are sent to our stripping area. Here items are stripped into their individual waste streams and sent on to our vetted downstream vendor for final material recovery. Manual disassembly has proved it's green credentials over power hungry mechanical shredding. As well as using zero energy a pure waste stream is produced that would be otherwise contaminated in the case of shredding.